The US State Department’s travel advisory about crime in Argentina brought an outcry when announced there in May. This national affront was the big news on Page 1 of La Nacion in Buenos Aires. The article listed all the ugly things that could ruin a tourist’s vacation. These included muggings, purse snatchings and pocket pickings by armed thugs, getting hassled in public demonstrations, run down by merciless drivers, and forced to hand over funds from ATM machines. As a food person, I experienced the most appropriate form of attack, the mustard scam. This happened in Buenos Aires on Avenida 9 de Julio, normally a busy street but quiet that day. A tiny woman sprayed mustard over my companion and me in an attempt to rob so inept it was ludicrous. I never felt the spray—it hit the back of my jacket. But I knew what happened when I saw the woman dabbing at my friend’s sleeve with a moistened tissue. I have to admire her bravery, attacking a man so tall and powerfully built that he could have tossed her easily across 9 de Julio, which is so wide you have to cross it in several stages. There were no accomplices, and the woman got nothing from our pockets. We moved on quickly, smelling so strongly of mustard that we would have been tempting prey for any hotdog addict. We passed two more scammers, one of them rushing out of a side street, probably late to work. They carried only a bottle of water. The mustard was concealed. I was curious about what brand they used, so I checked a local supermarket. There were plenty of choices in large squeeze bottles, but I won’t name the producers, because they weren’t at fault. I do know that it wasn’t Dijon, or whole grain, or herb-flavored. Just something so stinky that it drove us to the nearest pizza parlor to drown it out with the equally powerful but far more appealing aromas of oregano, tomato sauce and melted mozzarella. Thais crowd into Ord Noodle in Hollywood to get this rush. And if they can’t go in person, they beg friends to bring them an order. The soup is No.1 on the menu, as is fitting. It’s the restaurant’s signature dish, and Ord Noodle is named for it. But you have to read Thai to know that the real name is not Ord Noodle but Auut (as in auto) Kwayteow Hoi Ka. The famous noodle dish is kwayteow hoi ka Phitsanulok, which means dangling feet rice noodles in the style of Phitsanulok province in northern Thailand. That may not sound appetizing, but check the walls. You’ll see photos of people at the original Ord in a village near Phitsanulok, bare feet dangling below the counter. Here, customers sit on normal chairs, their feet firmly on the floor. Most of them are eating the famous soup, which is based on rice noodles, called kwayteow in Thai. These are the backdrop for more things than any ordinary soup bowl could ever hold, such as fish cake slices, a pale fish ball, tiny clumps of ground pork, pink-edged slices of Chinese barbecued pork, thin slices of pork liver, tender dried shrimp, fried garlic, crushed peanuts, bits of green bean, tiny flakes of hot red chile, bean sprouts, green onion and cilantro. All this in a delicious spicy, sweet and sour broth. The sour is vinegar, not lime juice, and the flavor is subtle compared to heady tom yam soups. Part of the rush comes from the exertion of sorting out so many flavors. The rest comes from sheer enjoyment. Even if you ask for “mild” the noodles are very spicy, because Ord Noodle doesn’t know the meaning of mild. You can choose between wide or thin rice noodles and have them dry or with broth, which is the better choice, because the broth is so enchanting. A light, fresh dish to balance kwayteow hoi ka is No.5, kwayteow lukchin doodoo tom yam, which means rice noodles with fish balls in aromatic soup. This one is composed of fish balls, sliced fish cake, crushed peanuts, a lot of fried garlic and a dash of red chile flakes. A lettuce leaf in the bowl looks pretty, but its real purpose is to cut the richness of the ingredients. Good as it is, nothing can rival dangling feet noodles, which have made Ord Noodle the hottest restaurant in Thai Town right now. Ord Noodle, 5401 Hollywood Blvd., Los Angeles, CA. Tel: (323) 468-9302. Open daily from 9 a.m. to 10 p.m. Cash only. The most extraordinary red wine can’t measure up to a cool crisp white on a hot summer day. This isn’t to say that white wines depend on the weather for their appeal. In Santa Barbara County—that’s Pinot Noir country, if you only know about it from the film “Sideways”—winemakers are also doing great things with whites and roses. The following list isn’t an evaluation of the “best,” but a sampling of interesting whites and a couple of roses for drinking this summer—or any time of year. The only Chardonnays are in blends, and the only Pinot Noir is a rose. Alternatives to Chardonnay include a Burgundian Aligote or an Albarino, made from a Spanish varietal. Try an aromatic Malvasia Bianca with spicy foods, Sauvignon Blanc with seafood and Muscat Canelli with fruit salad. The versatile Chardonnay blends include two with Viognier and one with Cortese. Another style of blend combines four Rhone grapes. The wines range from dry to sweet, something for every taste. They’re listed in alphabetical order according to title or varietal, with the roses at the end. Verdad Albarino 2006, $18. Winemaker Louisa Sawyer Lindquist specializes in Spanish grape varietals, releasing her first Albarino in 2,000. She made just under 400 cases of the 2006, fermenting 75% of the wine for 5 months in small stainless steel tanks, the rest in neutral oak barrels. Long, cold fermentation captures the aroma, she says. The wine has minerality, hints of orange blossom, lime and bitter almond, fig flavor in the middle and a bright citrusy finish. “Shellfish is meant to be a match,” Lindquist says. Au Bon Climat Aligote 2004, Mistral Vineyard, Central Coast, $14. A white wine grape from Burgundy, Aligote is similar to Pinot Blanc. The grape becomes riper here than in Burgundy, yielding a dry, rich wine. Winemaker Jim Clendenen blends a small amount of Aligote with Pinot Gris and Pinot Blanc for his Hildegard White Wine ($35). Qupe Bien Nacido Cuvee 2006, $20. Winemaker Bob Lindquist used ultra ripe Viognier grapes and Chardonnay grapes picked at the lower end of ripeness for this delightful summer wine. The blend combines 50 % of each. The Viognier contributes a lovely floral aspect, hinting of jasmine, while the Chardonnay provides structure and acidity. 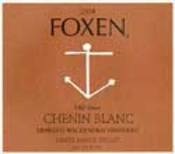 Foxen Old Vine Chenin Blanc 2004, Ernesto Wickenden Vineyard, $18. Bill Wathen of Foxen Winery says this wine will age better than Foxen’s Chardonnay, holding for up to 10 years. A completely dry, Loire style Chenin Blanc, it is a superb companion to seafood. Wathen suggests such matches as oysters, mussel salad and mildly seasoned ceviche. Daniel Gehrs Eleganza 2005, $28. This crisp, fresh, dry wine blends 70 % Chardonnay from Los Alamos with 30 % Viognier from Happy Canyon. The Chardonnay was fermented in stainless steel, the Viognier in new French oak barrels. The result is a wine with enough acidity and body to stand up to a shellfish dinner. Rideau Vineyard Grenache Blanc 2006, $30. The grapes for this wine come from Rideau’s estate vineyard, which is planted to Rhone varietals. It is elegant, crisp and slightly aromatic, a fine companion to light summer foods and excellent with appetizers and light seafood and poultry all year. Epihany Inspiration 2005, $20. Fess Parker’s son Eli started Epiphany Cellars in 1999 and has done so well he was named winemaker of the year for 2006 at the San Francisco International Wine Competition. Inspiration blends Roussanne, Marsanne and Grenache Blanc with Viognier, which adds a touch of sweetness. It’s a good wine to serve with spicy foods. Mosby Winery La Donna White Wine, $12. This non-vintage wine, which debuted in 2006, blends equal parts of Cortese and Chardonnay. It’s light and easy to drink, an excellent wine with appetizers. “I like to just lie back and sip it,” says winemaker Bill Mosby. Mandolina Malvasia Bianca 2005, $16. 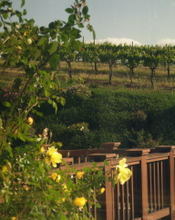 Mandolina is Lucas & Lewellen Vineyards’ line of Cal-Italian wines. Delicately aromatic, with flowery and spicy tones, this wine could go with anything from a fruit salad to spicy Asian dishes. The grapes came from Los Alamos, and Daniel Gehrs was the winemaker. Ovene Winery Muscat Canelli 2005, $15. Very fruity, floral and sweet (6 % residual sugar), this wine has enough acid to keep the sweetness in line. Ovene owner/winemaker Jeff White, who is based in Santa Maria, made only 100 cases, using grapes from Opolo Vineyards in Paso Robles. He suggests serving it with fruit salads and less sweet desserts. Consilience Roussanne 2005 $22. This wine was barrel fermented in older neutral French oak and went through complete malolactic fermentation. It is fruity and dry, but a fair amount of glycerin gives the perception of sweetness. “It’s definitely on the richer side for a white wine,” says winemaker Brett Escalera, who suggests serving it with fish or lobster. “It’s a white wine you can get creative with,” he says. The Brander Vineyard Sauvignon Blanc Santa Ynez Valley 2006, $15. Known for Sauvignon Blanc, Fred Brander makes nine of them, sourcing grapes from a variety of vineyards and producing different blends. 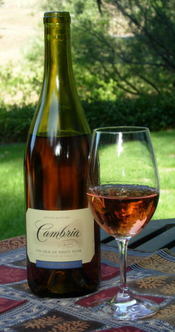 This wine combines estate grown fruit with grapes from other vineyards and was fermented primarily in stainless steel. It is in a riper style, with quite a bit of richness, too much for oysters, but fine with scallops or oily fish, says Brander. Gainey Vineyard Limited Selection Sauvignon Blanc 2005, $18. A blend of 94% Sauvignon Blanc with 6% Semillon, both from Gainey’s Home Ranch, this is the richer of the winery’s two Sauvignon Blancs. The wine was fermented 70% in neutral oak, the remainder in stainless steel. Serve it with poultry, grilled shrimp, crab quiche or with goat cheese salad, which is “a match made in heaven,” according to winemaker Kirby Anderson. Shoestring Vineyard & Winery Syrah Rose 2006, $22. This wine is Syrah-based, but gets some of its color from Grenache. Serve it chilled with appetizers, salads and seafood. Low alcohol makes it a good choice for summer sipping. Three friends and I decided we’d like to end the weekend with a peaceful dinner, early enough to avoid crowds and interesting enough to tempt us out on a lazy Sunday. And so we went to Tokyo Table in Beverly Hills. The serenely elegant dining room was almost empty, because we were eating at an unfashionable hour. 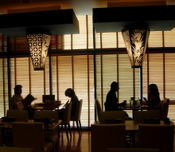 It looked its prettiest at that time, the shaded windows glowing like golden shoji screens in the late afternoon sun. One would expect such a handsome restaurant to be expensive, but it was not, and we grazed freely, choosing from a picture menu that ranged from traditional Japanese to imaginative fusion dishes such as sushi pizza. The pizza came on a wooden paddle like a real pizza, but the base was a square of sushi rice on a layer of seaweed. The seafood topping could have been drawn from a sushi counter, and there was a hint of mayonnaise, as in the lushly rich seafood appetizer called dynamite. Cut into little squares, each topped with a jalapeno slice, the pizza was addictively good, like eating delicious canapés at a cocktail party. The prettiest dish was tuna tataki salad, the slices of seared tuna balanced against a stack of very fresh greens, jicama and cucumber that had been tossed with a light vinaigrette. Each slice ended with a dab of strongly aromatic green shiso sauce. We ate hot oxtail ramen soup, dipping the meat in a soy and ginger sauce, and Morioka style cold noodle soup, a Japanese-Korean fusion dish made with kalbi (Korean for beef rib meat) and kimchi. This was similar to a Korean cold beef and noodle soup called naengmyeon, but the broth was sweeter and the noodles chewier. Stir-fried udon noodles with crabmeat and vegetables looked like macaroni, but I’ve never had macaroni dusted with fine flakes of dried seaweed. Our least exotic dish was a juicy steak topped with crunchy fried garlic chips and served with a soy and sesame dip. The steak sizzled so energetically that it had to be surrounded by a white paper collar to protect our clothes. By now the sun had disappeared, the windows were no longer golden, and we could not eat any more. It was a very good Sunday supper, for not much more than $20 each. 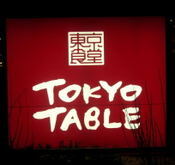 Tokyo Table Restaurant and Bar, 50 N. La Cienega Blvd., Beverly Hills, CA. 90211. Tel: (310) 657-9500. Open daily, 11:30 a.m. to 1 a.m.